How stunning is the colour of this purple asparagus? I've gotta admit, I didn't even know purple asparagus existed until I saw it at the shop but how could I resist buying a bunch when it looks like this? I was inspired by the asparagus and this Cajun Rice made by The Spice Trails to make a warm rice salad. 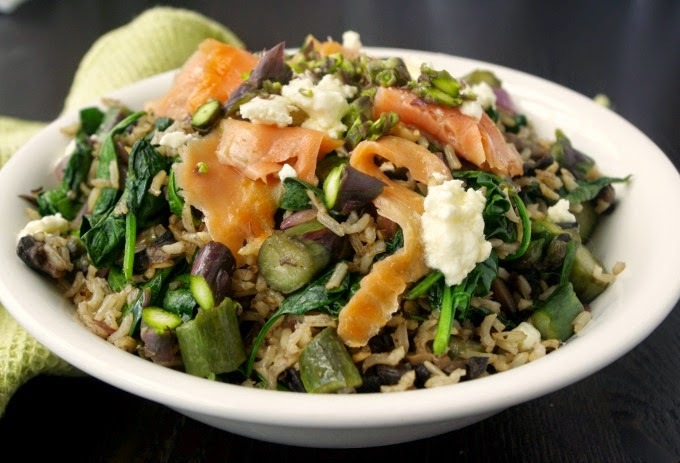 I had cooked brown rice and smoked salmon in the fridge, which I thought combined with the asparagus, would make an excellent base for a warm salad. I'd recommend keeping some cooked grains in the freezer to make salads like this super easy and quick to pull together. I cook up large batches of brown rice or quinoa and freeze them in 1 cup quantities in individual ziplock bags. I added some mushroom and spinach for some extra veggie goodness and I used feta and it's oil to add a creaminess to the dish. 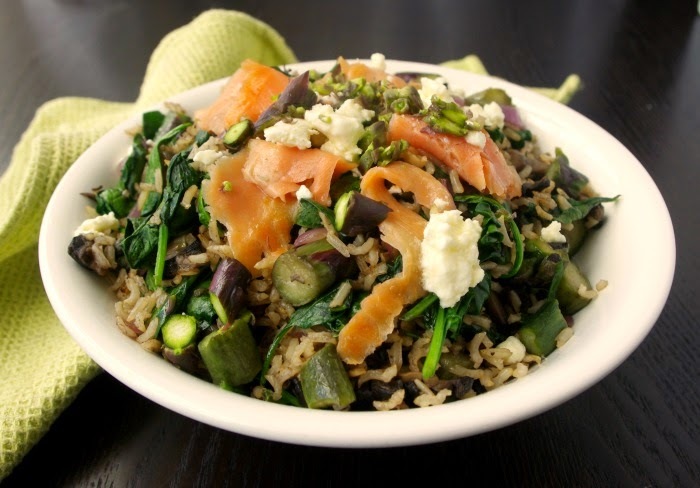 And voila, here is my Salmon and Purple Asparagus Warm Rice Salad. A fresh & colourful rice salad. Saute onion and garlic in olive oil and butter. Add mushrooms and asparagus. Cook for 2 minutes. Add cooked rice and stir until rice is coated. Add spinach and allow to wilt. Season to taste. 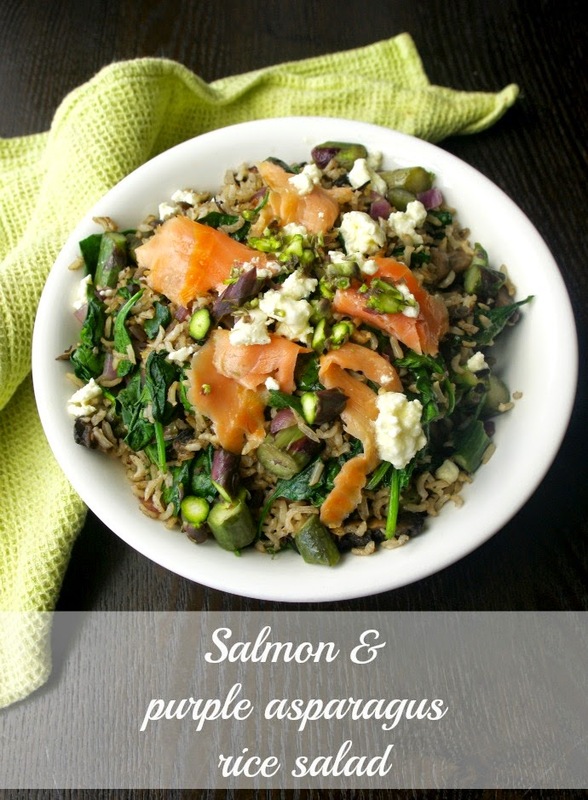 Place salad in bowl and top with smoked salmon and feta. Dress with lemon juice and feta oil. What a beautiful dish! 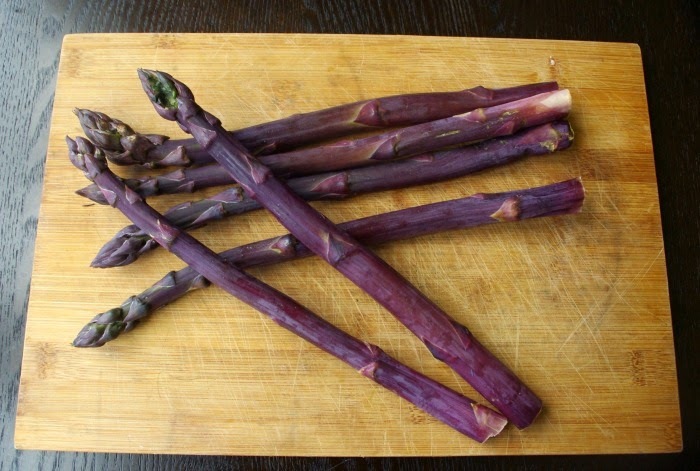 I have never had purple asparagus before, but come summer (live in the Netherlands), I'll definitely be trying this!! Yum! Pinning for when asparagus will be in season here! OMG I just want to reach through the screen and eat this!!! This is exactly my kind of dinner - light, healthy and tasty! I'm going to add salmon to my grocery shopping list right now. Thank you for linking up with our Fabulous Foodie Fridays party! Lovely, how gorgeous is the purple asparagus!